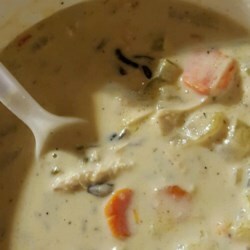 Reminds me of "Tastefully Simple's Creamy Wild Rice Soup"! I wanted to make it just a tad healthier so I made a couple adjustments. I used half brown rice and half wild rice and cooked them in broth. I added extra celery (diced) and added cooked carrots. Left out the butter and used 1 T. Olive Oil, worked great. This was one of the few recipes I found that called for milk instead of cream, but it was plenty creamy and thick. I used 2% but next time I'll try skim for even less fat.